I'm sorry I can't seem to upload things here. I have a very large map https://i.imgur.com/8tT7u0m.png that I am using to have different scenarios for Firefighters to teleport around and manage different scenarios. 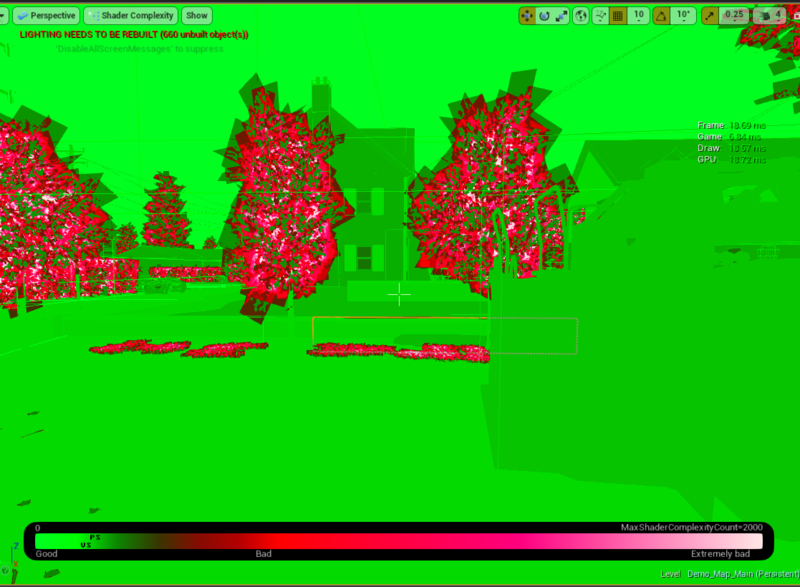 Each scenario has volume activated particles which are not active when the player is not present. After trying for two weeks to optimize it, I've decided to scrap it and start over, building small levels and streaming from a persistent staging level in which the player is in the fire truck and is "responding" to the call. I'm hoping this doesn't break immersion because there will be radio traffic as they listen to the information about the call they are going TO, so I have 5-10 seconds when they won't move. 7. 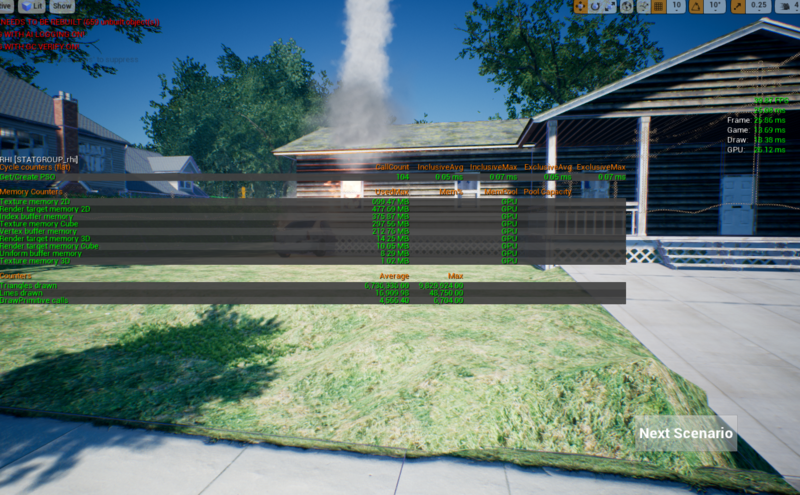 Forward Rendering is enabled with NO performance increase. FXAA barely registered, it was like 0.3 - 0.5 m/s I believe. Please chime in and help me try different things. I don't want to start over without understanding what went HORRIBLY wrong on this map. I also don't want to re-duplicate all that effort and find out it was because of a simple global setting or optimization that I didn't enable. (Might not even be a VR based optimization, I don't know, I didn't try forward rendering until the 2nd day of trying to fix things). Thank you very much for your help. It is hard to say what could be causing this to happen without more information. Have you checked out the following page on VR Performance? Give that page a read and see if there is anything on there that might help. 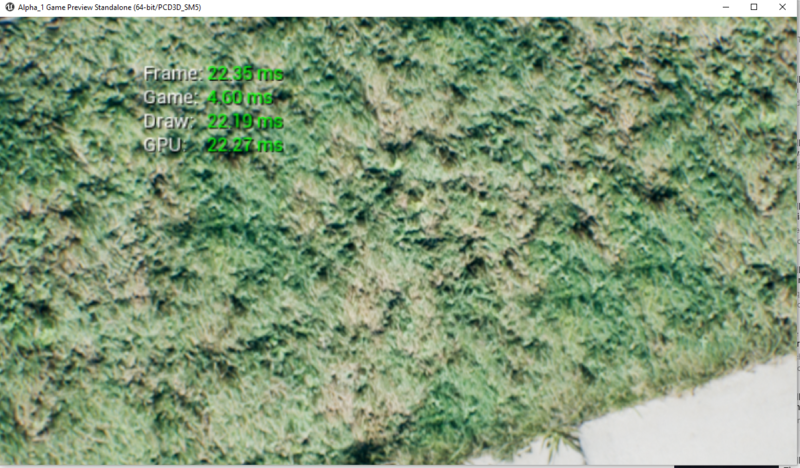 If that does not help you will need to take a look at what your GPU and CPU are doing using the profiling tools. Nine times out of ten you are going to GPU bound so I would first look into GPU profiling which you can read more about using the following link. If that does not help then you will need to profile your CPU which you can find out how to do using the following link. If you do end up posting pictures of stats make sure you sort them from highest cost to lowest cost(You do this by clicking on the MS tab in the GPU profiler) so we can see what is taking up the most time. I suggested that those be reduced prior to micro optimizations. I've been watching your streams and reading through the various docs. 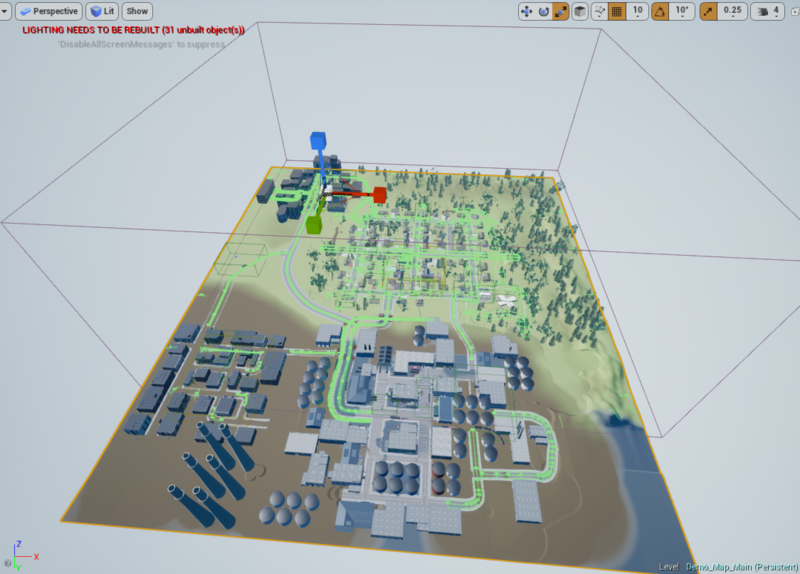 Unfortunately this map was built with complete and reckless disregard for optimization (I'm a Firefighter/Paramedic, so I'm used to just diving into things) I'm probably doing every single thing wrong, so I doubt any single change is going to let to fixes. 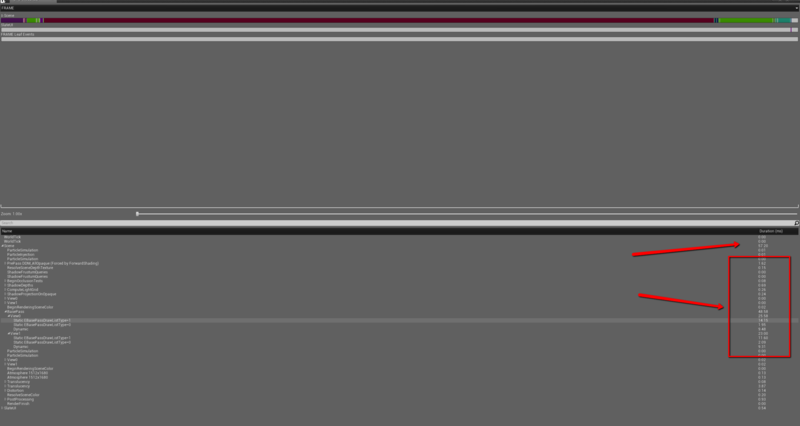 But I did want to check here...Do you have any recommendation for for a good resource for fixing drawcall issues? Other than the optimization livestream and rendering best practices, as well as the TechArt aids to optimization, I don't have a good resource for learning about reducing drawcalls. (Most material deals with finding the problem, not necessarily fixing it). Mordentral mentioned to me, that's probably my biggest culprit. Looks like you are using modules to build the houses, if yes you should merge them to single houses, using merge tool, it will reduce your drawcalls. Thanks, this is great stuff. 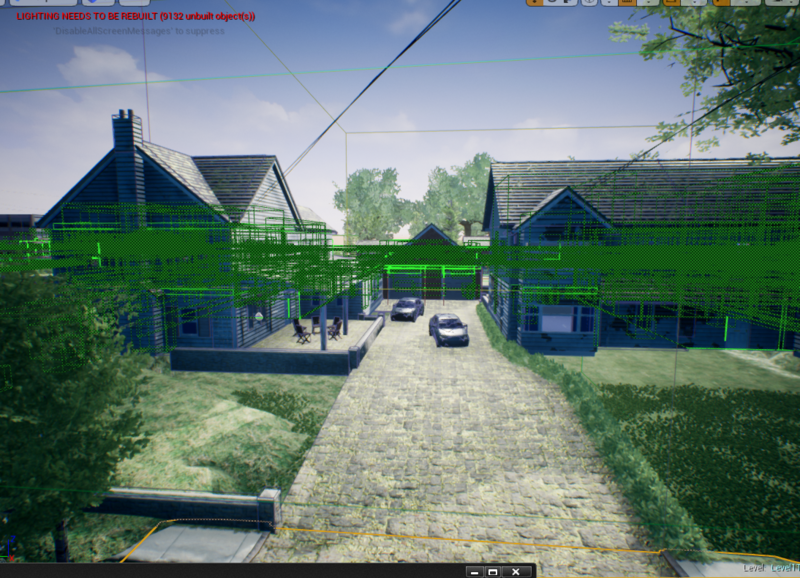 I did have a question though, I was reading the docs regarding Merge Actors - https://docs.unrealengine.com/latest...ctors/Merging/ .... do you have any recommendations of good settings for the Merge Actors for VR? I imagine I would want to merge materials to reduce draw calls. One issue is that I'd like to be able to simply reduce the resolution of all the materials and them merge them for every LOD but I have to designate a specific LOD which would mean I'd be stuck with whichever LOD was selected was there when I merged it. https://www.screencast.com/t/PPrIdgQ2lMH is a link to a video showing the simulator live. While it looks great the performance is obviously lacking...which is frustrating because I don't have to worry about low end or even middle range hardware....I'm using a 7700k with a 1080TI and that's what the platform would run on currently...it still can't handle it. You have to bake your lights. I've noticed the same issue before when I had poor performance in VR but when I baked the lights I noticed at least a 30% improvement in performance. That of course is not going to be easy for you if it takes 18 hours to get to 2% built.